“Ima!” cried 3-year old Noam the night before Passover last year. home and search for them with a candle and a feather. Guess what? Noam forgot where he hid his piece of chametz. Rest assured that he promised, guaranteed, vowed that he would not forget. I learned from that little episode that I must get every family to write down their hiding place on a scrap of paper (or dictate it to me) immediately prior the searching ceremony! Growing up in a “mixed-marriage” Ashkenazi/Sephardi family, I experienced the best of both worlds on Seder nights. “Bibilouya!” my Abuelo would announce suddenly at the onset of the Maggid part of the Seder ceremony. “Bibilouya!” Abuela would exclaim, jumping up from her luxury chair, rushing to bring Abuelo the Seder Plate. (The younger cousins would run away at this point for fear of getting their heads smashed a bit too hard. But I just gobbled up these large doses of rich colorful tradition). The Ashkenazi Seders held at Bubby Minnie’s humble abode were prized opportunities to fill up on matza ball soup, sponge cake (“look at how fluffy it came out this time!”) and too much Kedem grape juice. Sephardi or Ashkenazi, I now realize in retrospect that the warmth of Judaism had always been passed down to me in the guise of home-made traditional foods, Hebrew songs and plenty of family time. Seder night was the epitome of this muble-jumble of Jewishness. The Passover Seder is one of the most widely-observed Jewish traditions by non-observant and observant alike. This evening, rich with rituals, celebrates the miracle of our nation’s freedom from slavery in Egypt. 1. Our most prestigious (ok, I mean expensive!) 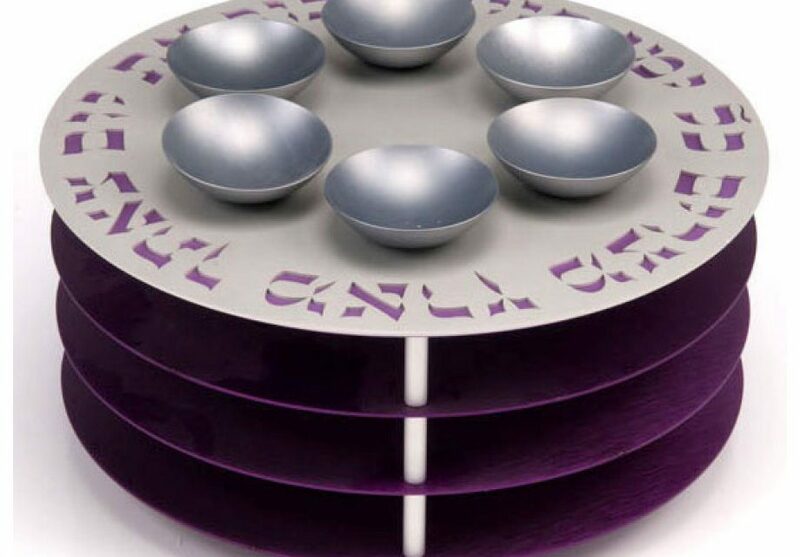 Seder Plates are designed by luxury Judaica designer Avner Agayof. 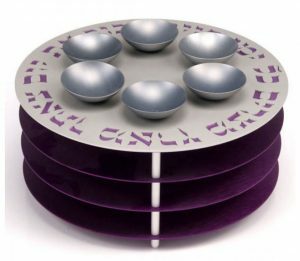 The Purple-Silver Agayof Seder and Matza Plate, made of ultra-modern anodized aluminum will add a dramatic touch to your tablescape. 2. Yair Emanuel, world-famous best-selling Judaica artist, has a fun and colorful selection of highly-detailed Seder plates. My favorite is the Oriental Seder Plate and Six Small Bowls, lusciously painted in shades of red and yellow and green and brown and scarlet and black and ochre and peach and ruby and olive and violet and fawn… ok, you get the point! 3. If you’re looking for a lively Jerusalem-themed Seder plate that will generate oohs and ahhs, the Rotating Seder Plate by Kakadu – Colorful Jerusalem is definitely for you. 4. An all-time favorite with our customers worldwide, a Dorit judaica item never fails to please and delight. 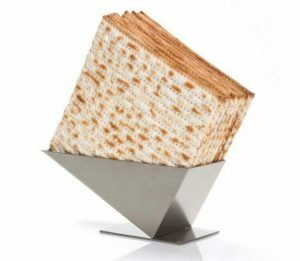 Dorit’s Passover collection includes coordinating matza and afikoman covers, seder plates and matza stands. Her Colorful Pomegranate Seder Plate will make for a striking centerpiece on your Seder table. 5. In search of something a bit more classic or affordable? 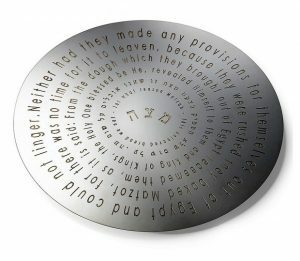 You will probably enjoy the Round Silver Plated Passover Plate or the Armenian Ceramic Passover Seder Plate. Wishing you a kosher and happy Passover! NextVegan Chocolate Chip Cheesecake for Shavuot from our Guest Blogger the Jewish Lady!